Just don't obsess over the FPS counter. The Dell G3 15 gaming laptop delivers solid performance in a package that’s a little less than an inch thick. It’s very affordable, too, at just $850 from Dell (at this writing) for the Model 3579 configuration we tested. The G3 15 has its downsides, including a Full-HD display that isn’t as bright as we’d like, frame rates that struggle to reach 60 fps on top-tier games, and a weight exceeding five pounds (although it’s not as massive as some gaming laptops). That said, the G3 15 remains a reasonably portable gaming system that makes the most of its Coffee Lake Core i5 processor and GTX 1050 Ti graphics. 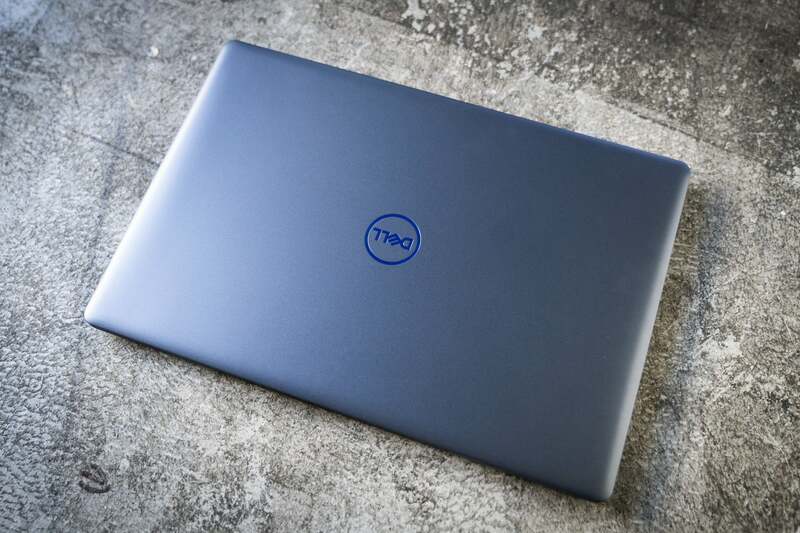 The Dell G3 15 system we reviewed (Model 3579) comes with Intel’s quad-core Core i5-8300H processor, a Coffee Lake CPU that—in a first for Core i5 chips—supports Hyper Threading. That means it can lend unused CPU resources to other tasks, maximizing efficiency and performance. Thanks to Hyper Threading, the G3’s 8th-generation Core i5 processor can leave older Core i5 chips in the dust, and keep pace with previous-generation Core i7 processors. The G3 15’s 1050 Ti graphics card (with 4GB of dedicated GDDR5 RAM) sits near the bottom of Nvidia’s line of GTX Series 10 graphics cards. It generally can be counted on to crank out maxed-out gaming visuals between 30 and 60 fps (or at least approaching 60 fps), depending on the title. We’ll test its real-world performance in a moment. Rounding out the G3 15’s basic specs are 8GB of DDR4 RAM, a 128GB SSD boot drive, and a traditional 1TB, 5,400rpm hard drive for data. If you’d rather spend extra for reliably buttery graphics north of 60 fps, you can step up to a $1,099 version of the G3 15 with a hex-core Core i7-8750H processor and GTX 1060 Max-Q graphics. The priciest G3 15 model falls back on GTX 1050 Ti graphics, but ups its RAM to 16GB and swaps in a larger 256GB SSD boot drive. 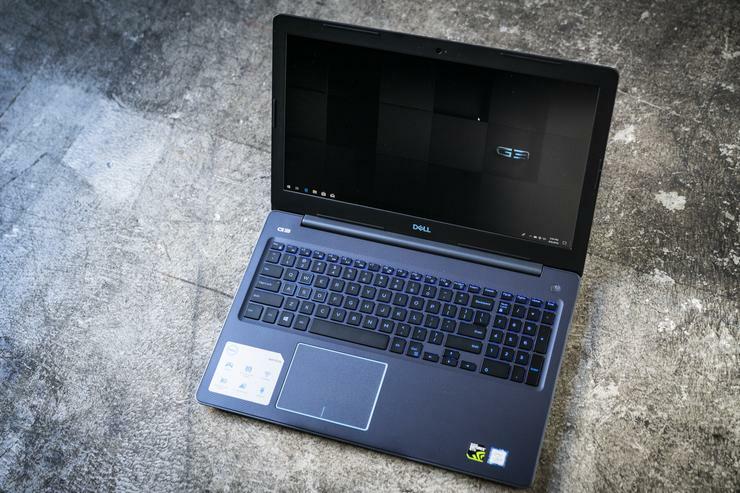 On the cheapest end of the G3 15 spectrum, Dell’s $749 G3 15 keeps the same Core i5-8300H processor and 8GB of RAM as our review unit, but downgrades to GeForce GTX 1050 graphics and loses the SSD boot drive. 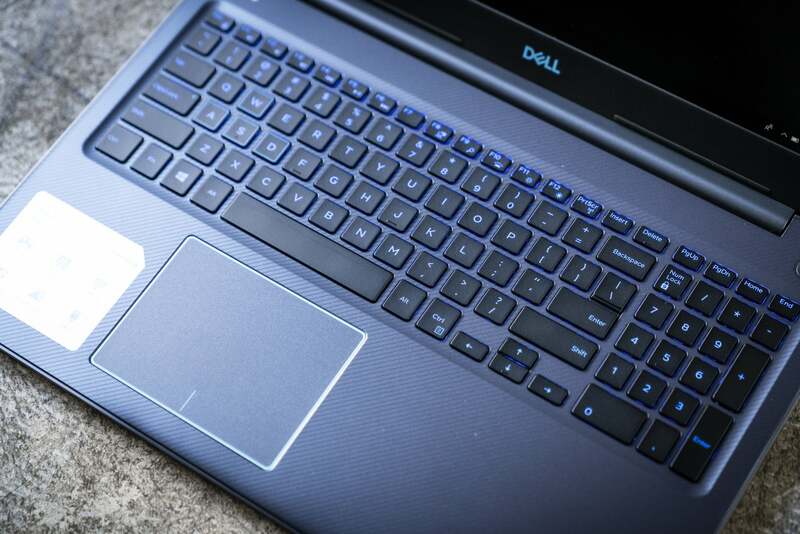 The Dell G3 15 comes with a relatively low-key design as far as gaming laptops go. No flashy LED patterns, racing stripes, or elaborate cooling grilles—it could easily be mistaken for a business laptop. Our “Recon Blue” review unit came with the familiar Dell logo stamped into the smooth, contoured lid. The G3’s cooling vents sit tucked away in back, just beneath the hinge. It’s plain on the outside, but the Dell G3 15 packs in solid gaming performance on the inside. Open the G3 15’s lid, and you’re greeted with more of the same: an average-width display bezel, a palm rest with subtle diagonal stripes, and a blue-backlit keyboard. Indeed, the only outward signs that the G3 is a gaming laptop are the outlined WASD keys. Measuring 16.35 x 10.99 x 0.89 inches and weighing about 5 pounds, 8 ounces, the G3 15 qualifies as a mid-size gaming laptop. It’s at least a pound heavier than say, the sleeker and far pricier MSI GS65 Stealth Thin 8RE, but it’s also considerably lighter than a souped-up, 10-pound luggable like the Alienware R17 R5. It’s much more comparable in heft and price to another budget gaming laptop, Acer’s Nitro 5. The Dell G3 15’s 15.6-inch IPS-technology display boasts impressive viewing angles. The 1920x1080 screen dims slightly starting at about 45 degrees or so. Tilting the screen up or down also dims the image a bit, but at least there’s no hint of inverse colors, as you might see on a lesser laptop panel. The Dell G3 15’s IPS display boasts decent viewing angles, but we wish it were a little brighter. That’s the good news about the G3 15’s display. The bad news: It’s not as bright as we’d like, registering only 246 nits (or candelas) at dead center according to our measurements. That’s barely hitting our 250-nit standard for comfortable indoor viewing. A 250-nit display might be perfectly fine for, say, a mainstream budget laptop, but we expect more from a gaming rig. The Dell G3 15’s chiclet-style keyboard is fairly standard as laptops go, with smooth, flat keycaps, decent travel and a snappy tactile bump on each keystroke. A hotkey lets you toggle between two steps of blue backlighting, while a 10-key numeric keypad sits on the right. Don’t expect anything in the way of bonus macro keys, but a standard set of function-enabled hotkeys, including screen lock, volume and media playback controls, search and display options, are present and accounted for. The outlined WASD keys are the only outward sign that the Dell G3 15 is a gaming laptop. The G3 15’s trackpad sits directly below the space bar, which puts is a little left of center thanks to the dedicated numeric keypad. The trackpad itself does its job without getting in the way with unwanted palm inputs, although I felt (as usual) that clicking the trackpad takes a little more pressure than I’d like. Of course, it’s safe to assume gamers will spend far more time with their mice than the G3’s trackpad. The Dell G3 15’s top-firing speakers aren’t too bad as far as laptop speakers go. Music sounded relatively crisp and detailed, with even a tiny bit of bass. I enjoyed the sharp pop of critical Dreg kills in Destiny 2, while a critter-zapping Conduit Shrine run in Diablo 3 triggered a satisfyingly crackling roar. The G3 15’s speakers are no match for a good gaming headset, of course, but they’re fine in a pinch, with enough volume to drown out the laptop’s purring cooling fans. The Dell G3 15’s webcam lens sits in the top bezel of the display, capturing 720p video that looks a little grainy, but is otherwise relatively sharp for a built-in model. While the G3’s webcam visuals won’t impress your Twitch followers, it’ll certainly do the job for Skype chatting. 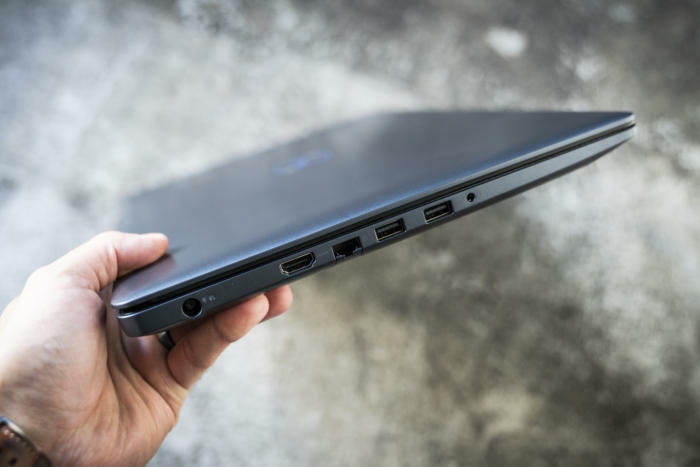 The Dell G3 15 gaming laptop comes with a solid selection of ports, starting on the left side with a barrel-shaped power port, a full HDMI 2.0 port, ethernet, a pair of USB 3.1 Gen. 1 Type-A ports, and a combo audio jack. 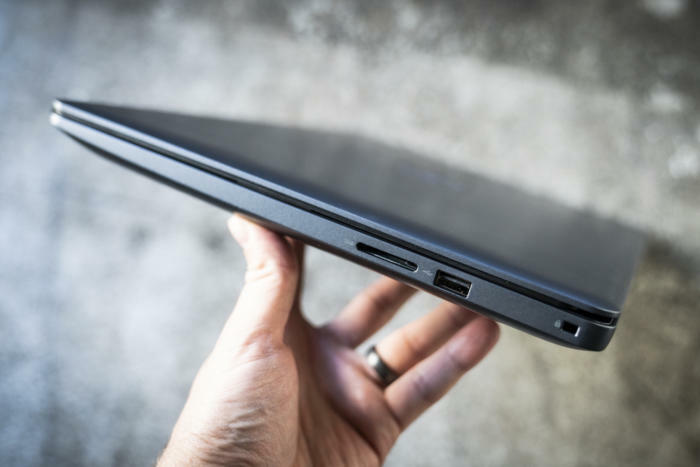 Left-side ports on the Dell G3 15 include a full HDMI 2.0 port and a pair of USB 3.1 ports, and there’s room for an optional Thunderbolt 3 port. On the right side, there’s a Noble lock security slot, a single USB 2.0 port, and an SD memory card reader. On the right side of the Dell G3 15, you’ll find a USB 2.0 port and an SD memory card reader. A Thunderbolt 3 port is an option for G3 models with GeForce 1060 Max-Q graphics, according to Dell. No, the G3 15’s not the most powerful gaming laptop on the block, not by a long shot. But based on our benchmark results (which skipped mainstream tests for the most part), it makes the most of what it’s got under the hood, including eight threads of CPU power. The less expensive Acer Nitro 5 has the same CPU, but the laptop's mere GTX 1050 GPU makes the G3 15's GTX 1050 Ti look good, even as it frequently falls short of the magic 60-fps threshold (when it comes to the latest high-end games, at least). In other words, if the Acer Nitro 5 is a good deal, the G3 15 is a little better, if you can afford the price bump. In an appropriate challenge for a souped-up multi-core processor, the HandBrake test measures how long it takes for a given laptop to encode a 40GB video file using this free utility. It’s a great test of how a system handles a heavy, temperature-spiking CPU load that could last over an hour in some cases. The Dell G3 15’s impressive Handbrake performance gets a boost thanks to its Coffee Lake i5-8300H CPU, which boasts HyperThreading support. The Dell G3 15’s Handbrake score of 2,607 seconds (about 43 minutes) stacks up nicely with that of Core i7 laptops that cost hundreds more, in part thanks to the Coffee Lake i5-8300H CPU and its eight threads of processing power. The G3 15 also manages to smoke last year’s Dell Inspiron 15 7000 Gaming Laptop, a Core i5-7300HQ-powered system that lacks the G3 15’s Hyper Threading support. 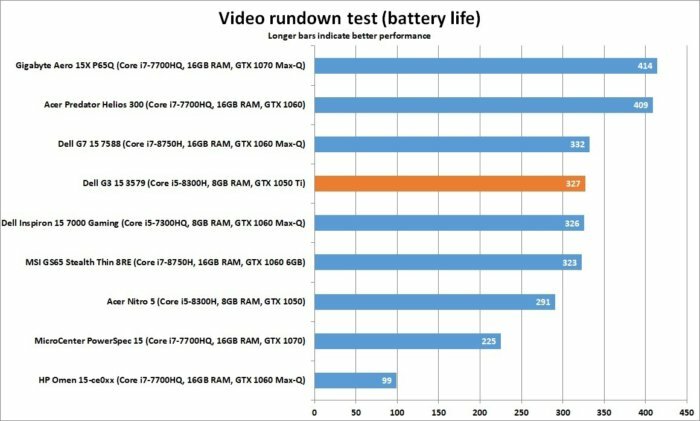 During the test, the 0.89-inch-thick G3 15 spun up its fans to a moderate volume, switched on power limit throttling (which puts the brakes on the processor’s wattage output) while holding its CPU package temperature at a reasonable 80 degrees Celsius (176 degrees Fahrenheit). In other words, the G3 did a nice job of keeping things relatively cool while still making good time with HandBrake. 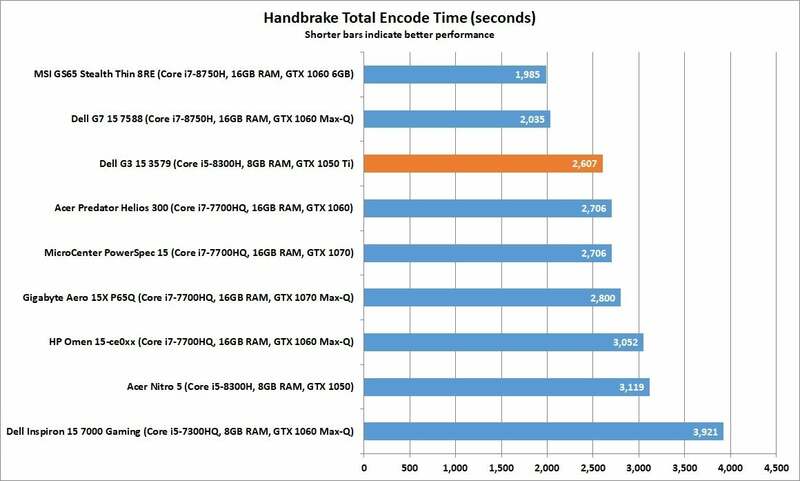 Of course, a CPU-centric benchmark like HandBrake doesn’t necessarily equate to sparkling gaming visuals. We’ll tackle gaming performance in a moment. Moving on to more CPU testing, our Cinebench benchmark measures a laptop’s performance as it renders a 3D image in real-time. Since it only takes a few minutes to perform, Cinebench demonstrates how a system handles short bursts of stress. We run the test in both single-threaded and multi-threaded modes, to show the advantage for systems with more cores and threads at their disposal. 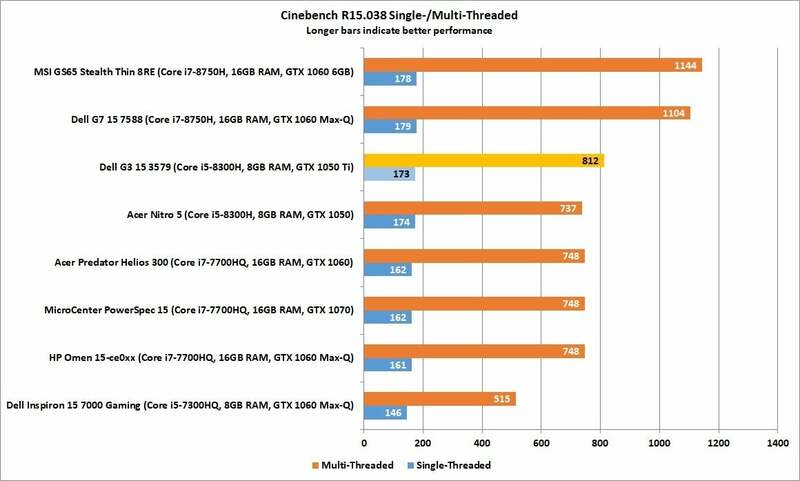 With help from its Coffee Lake i5 processor, the Dell G3 15’s Cinebench score manages to edge those of last-gen i7-powered systems. The G3 15 once again comes out looking pretty good, behind a few laptops with more powerful 8th-gen processors, but several steps ahead of pricier systems with last-generation Core i7 CPUs. Given that Cinebench rewards systems with the most threads, it’s no surprise that the G3 and its eight-thread i5-8300H snagged high marks. Time to move on from the CPU and focus on the graphics. Our first stop: 3DMark’s FireStrike Extreme, a graphics benchmark designed for higher-end gaming systems. This synthetic gaming test doesn’t directly translate into real-world gaming performance, but it’s a good jumping-off point for comparisons. 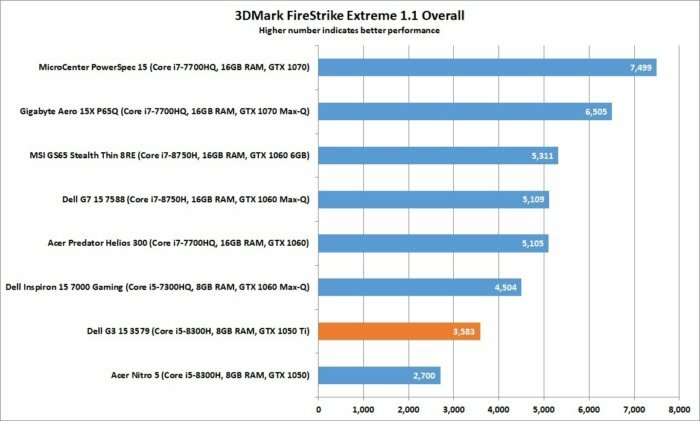 The limitations of the Dell G3 15’s GTX 1050 Ti graphics card became clear once we checked its 3DMark FireStrike Extreme performance. The Dell G3 15 can run 2013’s Tomb Raider at a little over 60 fps, but gaming laptops with more powerful GPUs regularly manage north of 100 fps. Moving on to 2013’s Tomb Raider, the Dell G3 15 managed to crank out a decent 63 fps with maxed-out graphics settings, a result that reflects the title’s greater reliance on CPU power compared to more recent games. However, gaming laptops with more powerful graphics cards can easily squeeze 100 fps or better out of this older title. 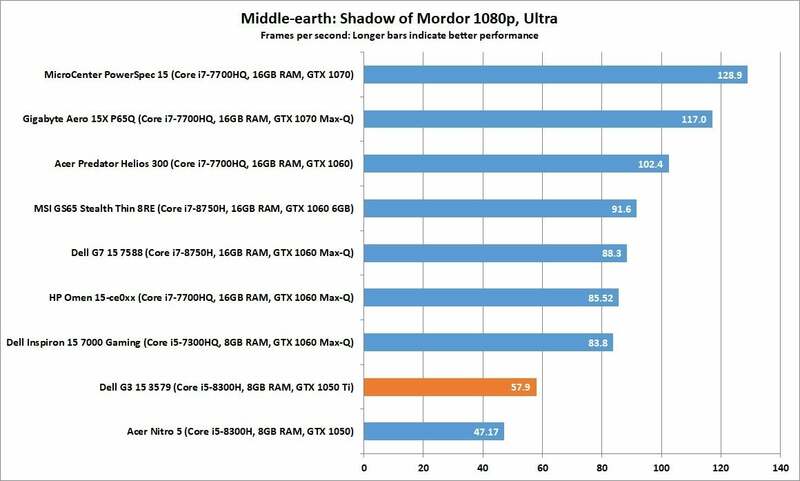 The Dell G3 15’s Middle-earth: Shadow of Mordor performance mirrors that of “Tomb Raider”: not bad, but eclipsed by laptops with GTX 1060 or better graphics cards. We see more of the same with Middle-earth: Shadow of Mordor. The Dell G3 15 snagging just shy of 60 fps on the game’s “Ultra” preset, compared to about 90 fps and up for laptops with GTX 1060 graphics or better. The Dell G3 15 and its GTX 1050 Ti GPU fall well short of 60 fps on the graphically intense Rise of the Tomb Raider. Last but not least, the Dell G3 15 had to settle for about 46 fps for the graphically intense Rise of the Tomb Raider on its “Very High” graphics preset. Pricier systems with GTX 1060 (and up) graphics cards are able to achieve well north of 60 fps. I also tried a few other games that don’t sit in our regular suite of gaming tests. With Diablo III on maxed settings, for example, the Dell G3 15 managed a smooth 120 fps, while I constantly got a solid-looking 45-50 fps on Destiny 2 using its “Highest” graphics preset. With Fortnite cranked all the way up to “Epic” settings, the G3 averaged about 45 fps, occasionally spiking to about 60 fps. The Dell G3 15 and its GTX 1050 Ti graphics card clearly struggle to deliver 60 fps for many games at max settings. That said, I thought the G3 15 delivered impressive gaming visuals given its $850 price tag, particularly once I stopped obsessing over the FPS counter and focused on tagging the bad guys. Gaming laptops aren’t exactly known for their stellar battery life, but at least the Dell G3 15’s battery won’t give up the ghost before the end of a Game of Thrones double-header. We test battery life by looping a 4K video using the stock Windows 10 video player, with screen brightness set to 250 nits (which meant cranking the brightness all the way on the G3) and turning the volume halfway up, with headphones plugged in. Battery life for the Dell G3 15 is pretty solid given its 56 watt-hour battery. With its score of 327 minutes (a scant 5.5 hours), the Dell G3 15’s battery life sits right where it should be considering its 56 watt-hour battery. Notably, the Acer Predator Helios 300 manages to squeeze out about 80 additional minutes from a slightly smaller battery. While it has a larger battery than the G3 15, the HP Omen 15-ce0xx languishes at the bottom of our chart because it’s saddled with a battery-hogging 4K display.